Visitors to the Division H exhibit booth at the American Educational Research Association’s Annual Meeting are greeted by ARNIE. Each year, the Division’s Annual Publication Award Competition is highlighted in the AERA exhibits. Entries from members conducting research, evaluation, and assessment in the schools from over 10 years can be searched, viewed, and downloaded there in the booth. Every year, the booth sponsor, ESP Solutions Group, sets up a local network for the booth’s laptops and any mobile device brought by a visitor to sign into the ARNIEdocs search engine and publications database. Anyone can explore the publication entries, award winners—current and past. 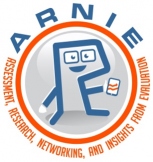 ARNIEdocs is accessible to anyone on the web for viewing at www.ARNIEdocs.info.